You also spent some time studying, usually in English class, another kind of highly structured language often called imaginative or creative. Poetry, fiction, drama, essay, and song are the genres usually associated with imaginative language. This kind of language tries to do something different from strictly communicative language—something to do with art, beauty, play, emotion, and personal expression—something difficult to define or measure, but often easy to recognize. We sometimes know something is a poem or a play simply by the way it looks on a page, while with a story or essay, we may not. 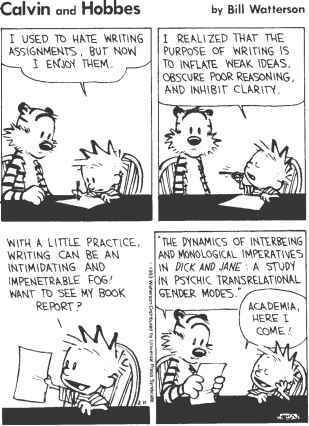 Writing to imagine Is different from Imagining to write Isn't it? But if I simply wrote the sentence, "Writing to imagine is different from imagining to write, isn't it?" you would pay it less attention. Ultimately, it is difficult to describe exactly what makes some writing quite imaginative (a poem by e.e. cummings) and some less so (my lines above). In other words, imaginative uses of language often gain effect not only from the ideas about which the authors are writing, but also from the form and style in which those ideas are expressed. In fact, some of the most important elements of imaginative writing may be formal and stylistic; if the author wanted simply to convey an idea clearly and logically, he or she would probably resort to more conventional prose.